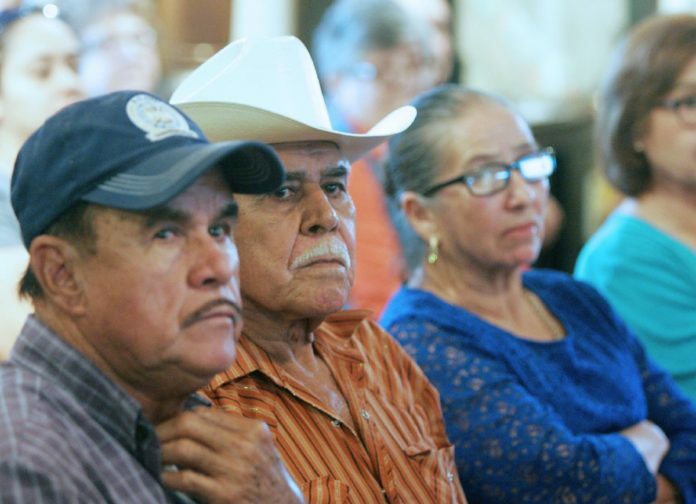 Aseño Barrera, center, who lives in a Roma neighborhood near the Rio Grande, listens at a meeting about property owner's rights at Casa Del Rio Tuesday, October 17, 2017, in Roma. Property owners and other citizens hoping to express concerns about border wall construction to the federal government on a face-to-face basis won’t get the chance after U.S. Border Patrol and Customs and Border Protection officials confirmed there will not be any more in-person public forums held on the matter. This and additional announcements were made earlier this week during a public webinar held by Border Patrol and CBP officials for important stakeholders and property owners. A BP official said the meetings will be held via webinar moving forward. The webinar comes after conservationists and others demanded more forums and public hearings in a letter, accusing the federal agencies for lacking transparency regarding border wall construction. The open comment period will end Nov. 6, the same day as the midterm elections. Nearly two weeks after conservation groups filed a lawsuit in response to waivers issued by the U.S. Department of Homeland Security to expedite the construction of walls in the Rio Grande Valley, members of the public were allowed to join an online meeting with the aforementioned officials. Residents questions related to the construction of barriers in and around their land, specifically as it pertains to the Valley as well as California. Laiken Jordahl, an organizer with the Arizona-based Center for Biological Diversity who participated in the Q&A with BP and CBP officials on Tuesday, said the federal officials decided against in-person meetings. Public meetings have not been held since summer 2017, when wall construction plans were first announced, save for a few meetings with local stakeholders, including mayors and other local officials. Jordahl said it was outrageous that the public is being denied in-person meetings when considering the impact construction will have on people and their property. The aforementioned lawsuit, filed Oct. 18 in Washington, comes on the heels of DHS Secretary Kirstjen Nielsen filing environmental waivers intended to expedite wall and road construction in Cameron and Hidalgo counties on Oct. 10 and Oct. 11. In its filing, representatives from multiple conservation groups including the Center for Biological Diversity, Defenders of Wildlife, and the Animal Legal Defense Fund challenge Nielsen’s issuance of the waivers filed last week.